When I first started emailing with Suzy Williams, I was researching my first “real” quilting article and in search of someone who was selling quilts. Not one of the Etsy sellers peddling them for $75, but someone who was pricing them to more accurately reflect the time and effort put into each one. 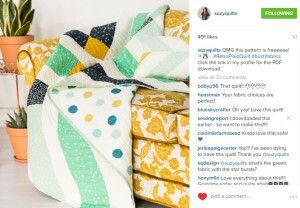 Somehow, I found myself at SuzyQuilts.com. Elegant, modern quilts filled the home page. Her prices for baby quilts started at $200 for made-to-order, with custom orders going for $325+. This was someone who understood the monetary value of a quilt. Williams has been quilting for over 15 years with a background as a graphic designer. That explains why her website, photography, and graphic elements look so effortlessly put together. Every quilter shares common ground – it’s like being part of a secret underground society. If you don’t quilt, you won’t understand it. To better describe it to people unfamiliar with quilting, Williams says she introduces two words: textile design. She feels it elevates the art form in the eyes of others. The spunky, ombre brunette has garnered an impressive following on Instagram @suzyquilts. 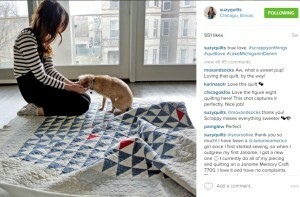 One of the top nine posts under #quilting is usually one of Williams’ photos. Even though Williams was profiled in the Quiltonomics article as a quilt seller, she says she quickly came to a hard realization about making and selling quilts. According to Williams, the cost and time invested into each of her quilts makes it impossible to create a sustainable business unless she sells them as pieces of art – and dramatically raises prices to match. Williams and I started emailing back and forth about a week before QuiltCon West in Pasadena, CA. 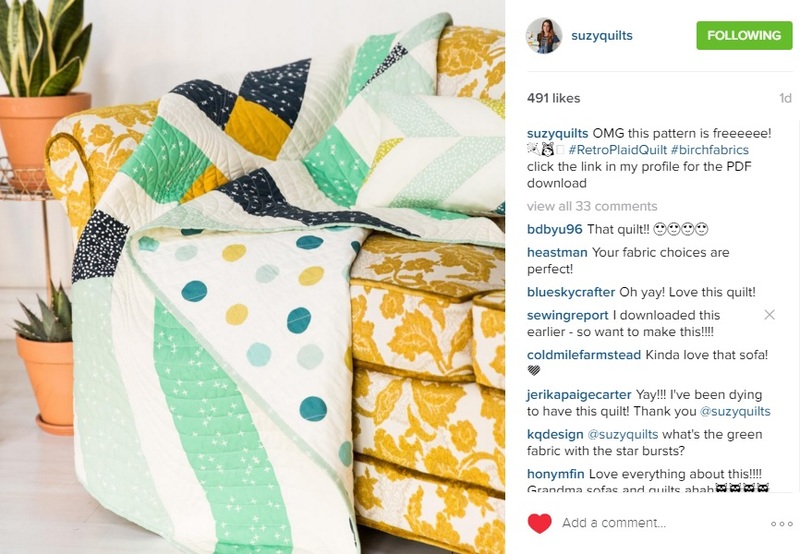 I’d visited SuzyQuilts.com and noticed quilt patterns for sale, rather than finished quilts. More how-to’s and tutorials on her blog. It appeared she was evolving in her personal brand. We met up at QuiltCon on a Thursday. Though it was the first time meeting, I quickly felt like Williams was an old girlfriend and we were just catching up. Even she didn’t seem to quite grasp her huge popularity online, and there’s an authenticity to her that just can’t be replicated. When I ask her how she accomplishes such amazing photography, she tells me a secret: Williams uses a digital point-and-shoot camera on the auto setting and boosts the images later using Adobe Photoshop and heightening the brightness and contrast. Williams says she’s now turning down custom quilt requests, and in the future – will only sell quilts she has designed herself with fabric she chooses. “This will be a total experiment, so I’m not sure how it’s going to go down,” she wrote in an email. The ultimate dream for this quilter would be to license or sell her patterns to manufacturers to mass produce her designs, so that perhaps her quilts would be in homes across the country – possibly the world.